If your interest lies solely in the brief report of our conversation with Dave Cormier, go straight to the summary report below. Jenny and Frances met through the first Massive Open Online Course (MOOC) CCK08, run by George Siemens and Stephen Downes in 2008. In contrast with the huge MOOCs that followed it, CCK08 has been characterised as a connectivist MOOC or cMOOC. Separately, we undertook research from that MOOC , and though we have come across each other from time to time, we did not work together until January 2014 when we met on a MOOC convened by Dave Cormier, Rhizomatic Learning – The community is the curriculum, now commonly called #rhizo14. Rhizo14 was a diverse and busy MOOC: light on readings and loosely structured around weekly ‘provocative’ questions posed by Dave. Interaction between participants was lively, spread across a variety of platforms and spaces: the P2PU space, Dave’s and participants’ blogs, #rhizo14 Twitter hashtag, a G+ community, a very active Facebook group and of course the less visible but equally valuable backchannels. There was evidence of joy, creativity and a few clashes of expectations where participants seemed to expect different things from #rhizo14 and were sometimes disappointed by the actions and behaviours of other participants. That is a scant description of what happened. We were struck by the contrasts between #rhizo14 and other cMOOCS: there were plenty of learning moments but we also experienced and observed some rather painful interactions. Our curiosity was piqued: we wanted to know what was going on beneath the surface and how a range of participants were experiencing #rhizo14. This seemed significant, given that MOOCs are an opportunity for learning for people who may not otherwise have access to formal education. This inspired us to undertake some research, starting by recording our participant observations, saving links to significant interactions, and then planning how to get participant views first hand. Given that our research was, to some extent, precipitated by concerns, we were both conscious of the dangers of finding what we were looking for in our research, as outlined by Stephen Downes in his presentation on MOOC Research. It seems to be a good thing to strive for objectivity, whilst acknowledging that it is an unachievable goal. In outsider research where the researchers see themselves as outside the researched situation, objectivity is a key element of the traditional science-based approach normally adopted. However, the emphasis on the rigour of the research method can compromise the relevance of the research. 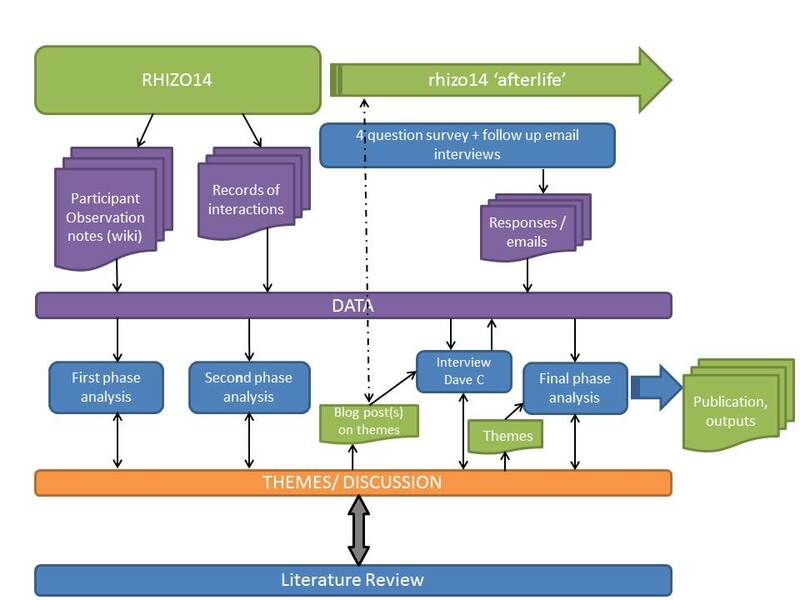 We were engaged in insider research, we became participant observers in #rhizo14. We could acknowledge the danger of reduced objectivity (whilst taking measures to counteract it) but we could also benefit from the subjectivity of researchers and other participants who shared their views with us. Subjectivity can bring a significant contribution to research in complex situations involving people and their relations with material things and each other. Our research process developed organically – the current (but probably not final) representation of this is shown in the following diagram. As well as being mindful of and explicit about our roles as researchers, we are very conscious of the partial nature of the data we have collected and are trying to analyse. The distributed nature of the spaces, the mix of public / private, and the number of survey respondents (47) combine to remind us that we must be missing some important perspectives. What does encourage us is that despite this partial view, our decision to allow for confidential and electively anonymous responses to our surveys, has enabled a light to be cast on what people are thnking, and not saying in public and semi-public forums.. We will make a contribution to the hidden MOOC experience. Having conducted our survey and email interviews,and recorded our observations, we were conscious that we were missing another important perspective, that of Dave Cormier the course convenor. We approached him to engage in a conversation, rather than an interview, loosely based on the issues and ambiguities that had emerged to date in our research. Whilst Dave’s natural inclination was towards openness, he graciously conceded the benefits of having a private conversation where we could discuss issues freely. The outcome was that although we recorded the Skype conversation between Dave and Frances, we agreed that the recording would be shared between Dave, Frances and Jenny, to be used confidentially for research purposes. Although this blog post is written by Frances and Jenny, it has been agreed by Dave prior to publication. We started by establishing the privacy/ confidentiality arrangements for our conversation and how we would publish it on blogs. We explored the actual ethics of research as compared with formal ethical approval. It is interesting that some of the most interesting parts of the conversation don’t make their way into the following summary. In a way, this vindicates its private nature. The following summary is not in strict chronological order as the conversation took itsown course, returning to topics at different times. Dave explained that his conceptions of community owed more to Nancy White than to Etienne Wenger’s Community of Practice. He feels that being able to participate in a community of knowing is the goal of the learning process, and for him community is people caring about each other. Dave discussed his experiences in EdTechTalk community , that he started in 2005 with Jeff Lebow and the benefits of being part of EdTechTalk. Dave highlighted the impact involvement in EdTechTalk had made on his work at UPEI. We discussed that while both teachers and learners may form community, teachers may particularly value parallel community experiences to those they are facilitating with their students. Sustainability of communities and MOOCS proved to be an interesting topic. We discussed examples of more or less sustainable examples of each. This was an interesting topic. There seems to be inevitable tension between the two concepts, and we discussed the advantages and disadvantages that can emerge from this tension. Community is the curriculum is a concept that Dave explored in the lead up to his 2008 article. Dave has found the rhizome useful in the cause of getting rid of the ‘content’ in education as he sees that as in opposition to how people, doctors for example, really learn their practice. Several times we returned to the issue of the centring or otherwise of Dave’s role in the course. We explored the benefits that his leadership brought and also some of the problems in which it played a part. Is it possible to achieve benefits such as seen in EdTechTalks without a leader? We also discussed the effectiveness of some of the tactics that communities employ to take the focus away from a leader’s decisions and actions, including community guidelines, FAQs, distributed moderation. This was a rich discussion drawing on real incidents from rhizo14, and made more possible in the context of a private conversation. Inevitably, we ran out of time to discuss everything on our agenda. It was a challenging, rich and warm discussion that will inform Jenny and Frances’ research and Dave’s planning for rhizo15.